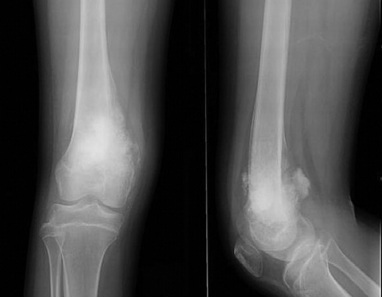 Benign or malignant orthopaedic tumours may involve the bones or soft tissues of the skeleton. Primary bone tumours are relatively uncommon but bony metastases are and will often be referred to orthopaedic surgeons for stabilisation. Pain (especially night pain), swelling and a change in size of a mass are worrying features that require further investigation. Benign bone lesions on X-ray have well demarcated margins with no associated soft tissue mass or periosteal reaction. These include simple bone cysts, enchondromas, osteochondromas (exostoses) and aneurysmal bone cysts. Malignant lesions have an aggressive appearance on X-ray with bone destruction, poorly demarcated margins and periosteal reaction, often with an associated soft tissue mass. These include osteosarcoma and Ewing’s sarcoma. liposarcoma, fibrosarcoma, leiomyosarcoma and synovial sarcoma. If the biopsy of a lesion indicates malignancy, the patient requires staging, including investigation for metastases with a CT chest (most common site is to the lung) and bone scan. Surgical excision is performed with concurrent chemotherapy and radiotherapy as guided by oncologists. casts or braces, simple cysts rarely require further intervention. A benign bone tumour which is often solitary but may be inherited with patients having many lesions in hereditary multiple exostoses. Pedunculated lesions arise from the joint line and grow away from the joint. May be left alone unless they cause local irritation or become symptomatic (pain may indicate malignant transformation which occurs in about 1%) in which case, they may be excised. Commonly seen in childhood and adolescence with a second peak in 6th decade. Most often affects distal and proximal femur, proximal tibia and proximal humerus. Histology reveals a high-grade spindle-cell tumour. Treatment is neo-adjuvant chemotherapy (pre- and post-surgery) with tumour excision and reconstruction with custom designed prostheses. If this involves the joint, this will be excised and replaced with a prosthesis. Following treatment survival depends on whether the tumour had metastasised at presentation: 10 year survival 90% with no metastases but only 30% with metastases. 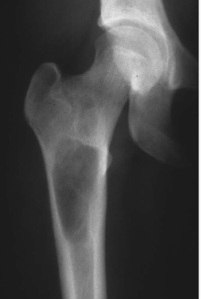 Occurs in children and adolescents, most often in the femoral shaft. Patients receive neo-adjuvant chemotherapy followed by surgical excision and reconstruction. Survival rate at 5 years is 60-70% with no metastases, dropping to 20% when metastases are present. prophylactic fixation of bones to prevent fracture (most commonly the femur will be stabilised with an intramedullary nail). Require investigation if any part of the history or examination point towards malignancy (rapid increase in size, pain, deep lying tumour) with MRI and biopsy. If benign, marginal excision is adequate. Malignant soft tissue tumours require a wide margin of excision, following by radiotherapy to the tumour bed to reduce the recurrence rate.